"Easy and quick. I feel comfortable knowing what my BAC is after using the AlcoMate Prestige." "My husband uses the AL6000 to test his buddies before they leave after poker night." 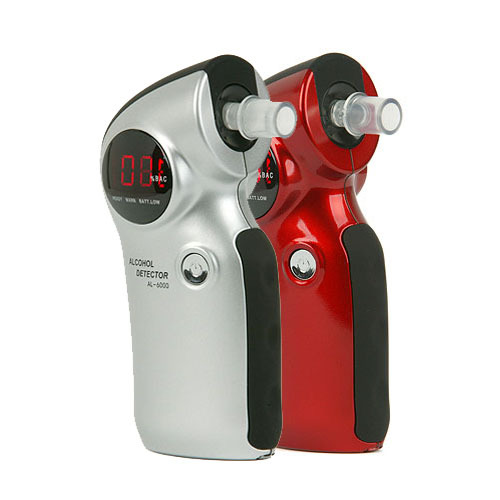 The AlcoMate Prestige AL6000 breathalyzer with 3 decimal points accuracy is an advanced professional alcohol breathalyzer equipped with sophisticated modular sensor technology. US Department of Transportation APPROVED for screening purposes. Responsible drinkers will appreciate the sophisticated modular sensor technology of the AlcoMate Prestige AL6000 breathalyzer offers three-decimal point accuracy in a professional grade alcohol testing system. The AL6000 brings you a sleek design with precise and accurate measurements at a price that is affordable for most budgets. This unit is a fabulous gift idea that might just save your friends’ life! This highly accurate breathalyzer uses the latest and most innovative technology to give you a precise and reliable measurement of intoxication. Enhanced reliability and accuracy in testing are a result of the patent-pending modular sensor replacement technology that is on-board the AlcoMate Prestige AL6000! This technology eliminates the need to return the unit to a service center for calibration. The user just purchases factory calibrated sensors and swaps them out when needed. This gets rid of the potential problem of being without your unit when you need it. This is an important feature for law enforcement officials or in fields where shipping the unit out for calibration causes problems, such as in remove field applications or when the user is at sea. A calibrated and ready to use breathalyzer is always on hand with the AlcoMate AL6000 breathalyzer. Users of this breathalyzer love the new sensor replacement system that allows them to quickly pop in a new sensor module and then keep on testing with accuracy that is factory certified. There is no longer a need to wait for weeks in order to get the BAC testing unit back from the service center following recalibration. Within just minutes, you are back up and running with this breathalyzer unit. Color choices: AlcoMate Prestige is available in Red and Silver. At this time colors are sold based on availability. As we do our best to meet your requests, we cannot offer a choice at this time. What is a "Pre-Calibrated Field-Replaceable Sensor Module"? The AlcoMate Prestige AL6000 is the first unit of its kind to offer a field replaceable, pre-calibrated sensor module. This patent-pending technology sets AlcoMate apart from the competition and is one reason that we are a top brand among police departments around the world. A big problem with using a breathalyzer in a critical application is that the equipment requires re-calibration in order to maintain its accuracy. Having the ability to install a fresh sensor module that has been factory re-calibrated without having to mail the unit off to a service center ends the delays that is caused by processing and shipping from both ends. The complications of re-calibrations are avoided with the snap-out and snap-in application of the AlcoMate Prestige AL6000.